Build Massive Strong Legs & Glutes With This Amazing Workout And Tips! Your next leg day awaits! If you’re up to the challenge, this 6-step leg and glute workout will help you build bigger wheels. Don’t fear it. Just try it! First things first: If you can’t push yourself hard in the gym. On leg day more than any other, effort correlates with success. In order to build bigger legs, hamstrings, and glutes, you must want to quit—and then not succumb to that wish. And then, of course, you still need to follow a well-constructed routine. Sure, you can put a hurting’ on your quads with endless triple drop sets of leg extensions that’ll surely have you screaming in pain, but that alone isn’t going to get you growth. The burn is part of the plan, but not all of it. Squats are the obvious place to begin your leg-day thrashing. Why? Let us count the ways. 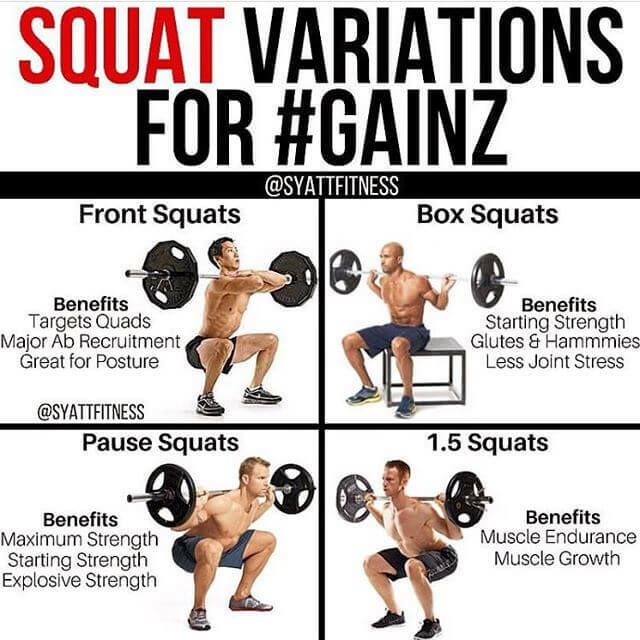 Squats are the most challenging leg movement, you can move the most weight with them, they recruit all the lower-body musculature (and more core and upper body than you might think), and they’ve been shown to spike muscle-building hormone release better than any other movement. 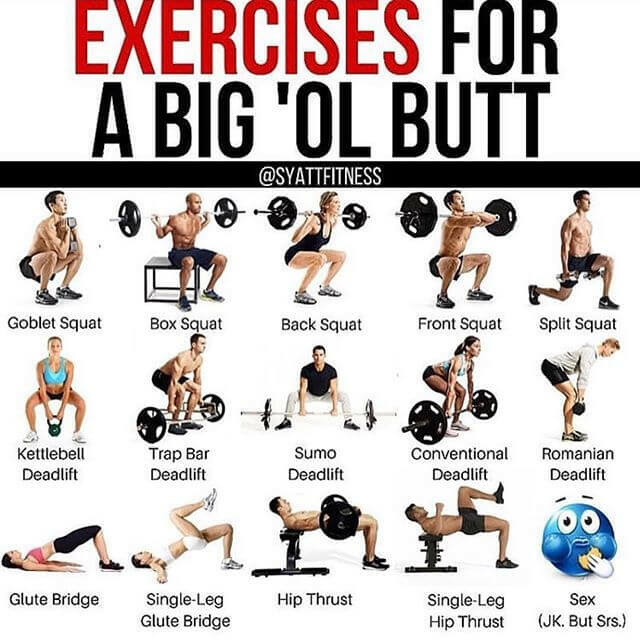 Squats are actually a family of exercises that combine hip and knee extension, and there are any number of variations, all of which have their own value. Some differ by bar placement, others by type of equipment used, and still others by foot position. 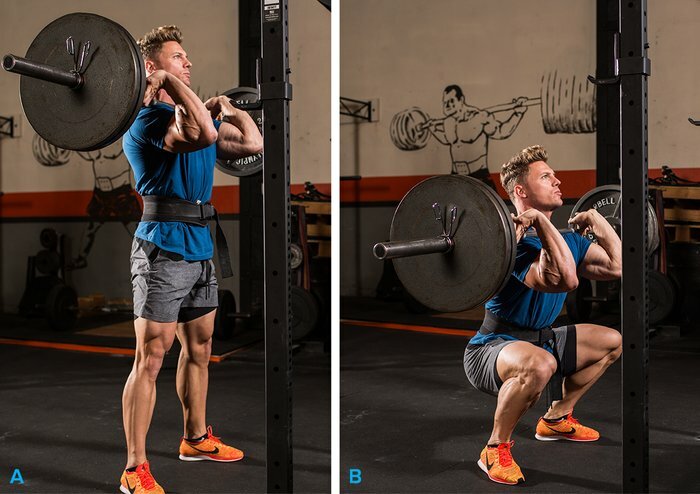 Yes, you could start your leg day with front squats or a single-leg squat variation. But for this mass-building routine, we’re going with the high-bar back squat, in which the barbell sits atop the upper traps. This version is preferred by most bodybuilders because it hits the lower-body musculature fairly evenly, and because you can move more weight with it than most other variations. The most common recommendation is to squat at least to a point at which your thighs are about parallel to the floor, but honestly, that’s relative to each individual and their flexibility. No matter how deep you go, it’s paramount that your spine remains neutral and never rounds, which can put dangerous forces on the discs. 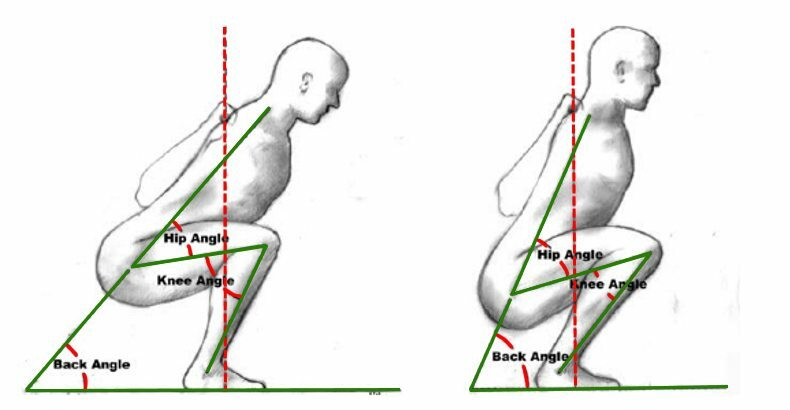 The solution: Work on your flexibility; tightness in your hip flexors and calves can also affect the depth of your squats. That, along with tightening up your technique will pay off big time—as long as the form is good, a deeper squat is always a better squat. Do multiple warm-up sets, pyramiding up in weight each time, but never come close to failure in warm-ups. Most workouts designate the 8- to 12-rep range as the proper muscle-building zone, but in the first few working sets of your workout, when your strength levels are highest, opt for the heavier loads. So instead of choosing a weight at which you fail at about 8 reps, go slightly heavier for sets of about 6. This gives you a slightly better strength-building stimulus. No, it’s not time to start doing machines yet. In this workout, you won’t even go near a machine until the end of your training session. We’re still looking at knee- and hip-extension movements, and your best choice is probably one that matches up best with your personal weaknesses. Most recreational lifters come up a little short with quad development, so the front squat is the on-deck hitter in this routine. The simple change of moving the bar from behind your head to the front changes how the load is distributed over the lower-body musculature. 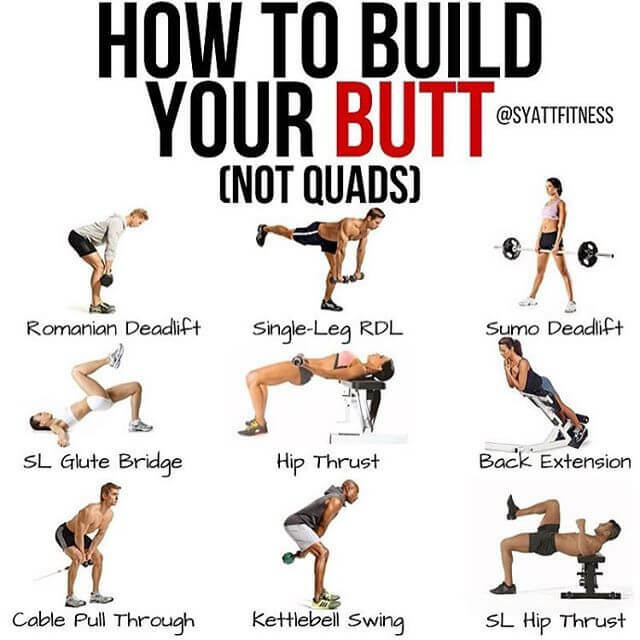 It emphasises the quads over the glutes and hams, which means you’ll have to lighten the load. The movement also requires that you maintain a more vertical position, which can be kinder to your back while also enabling you to squat deeper. Because you’ve already done serious strength work for sets of 6, consider a lighter weight that can be done for sets of 10-12. You’ll work some different muscles, but also give some of the same ones a slightly different stimulus. 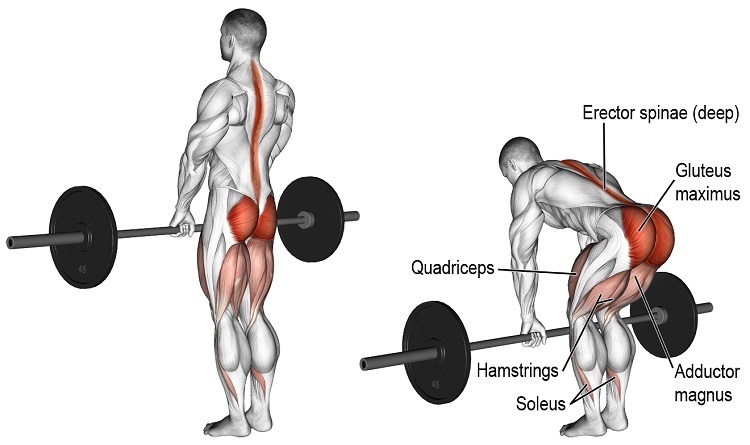 The Romanian deadlift is the perfect backside builder to slot in after your squats. It’s an upper-hamstrings/glute exercise that’s unlike most other single-joint moves because you can really overload it. Plus, most hamstrings exercises are leg-curl movements (which work around the knee joint), while this one is performed by bending at the hips. It’s vastly underutilised in most trainers’ workouts, another reason it’s probably a good fit in your routine. But as with most heavy movements, the key is to not do it wrong, which can put your back at risk. With RDLs, you never want to allow your lower back to round or the bar to drift away from your shins. If this makes it really hard to go down to the ground, good—you shouldn’t be going all the way to the ground on RDLs anyway. Just get a good stretch, go down as far as you can while keeping your back neutral, and come back up. Learning good form is imperative, so keep practising with light weight. Once you’ve got the technique down, start loading this up, but always be cognisant of keeping your back flat. Once you master the form, you should be able to push some very good weight with these. After warm-ups, shoot for 2 heavy sets of 8 reps and 2 back-off sets of 12 reps.
Now that you’ve got the heavy bilateral work out of the way, it’s time to work each of your legs individually. The Bulgarian split squat, where you stabilise your rear leg on a bench behind you, is an ideal choice. Elevating your rear leg forces the front thigh, especially the quad, to pick up more of the workload, while also torching the glute of that leg. If the balance component is too difficult at first, you can substitute split squats or lunges. In a pinch, you can do these on the Smith machine. Don’t let the fact that you can’t load these up like back squats fool you into thinking this is a weak movement. You can’t use much weight on this movement, even if you didn’t precede it with the other squats. Shoot for 3 sets of 10 reps, alternating sides. You won’t build great legs with machines alone, which is why the leg press isn’t very high on the list. But machines are ideal at increasing your training volume later in your workout, when your thighs are fried and you have trouble maintaining balance and good form. What’s more, you can adjust your foot position to change the focus. Higher on the sled hits the glutes and hams more, while lower on the sled shifts more of the focus to the quads. Likewise, the deeper you go, the more the hams and glutes have to work. Since this portion of the workout is when you’re looking to deliver a serious pump to your muscles, drop sets make far more sense here than, say, with back squats. The pump promotes hypertrophy by driving blood into the tissue, a different growth mechanism than the tension generated by those heavy squat sets early in your routine. Ready your mind and embrace the assault on your thighs. Do 3 sets of 10-12 reps, doing a double drop on your last set to magnify the burn. The hamstrings are antagonists to the quads, so you want to ensure they’re getting plenty of work to match what you’ve been doing for the front side of your body. 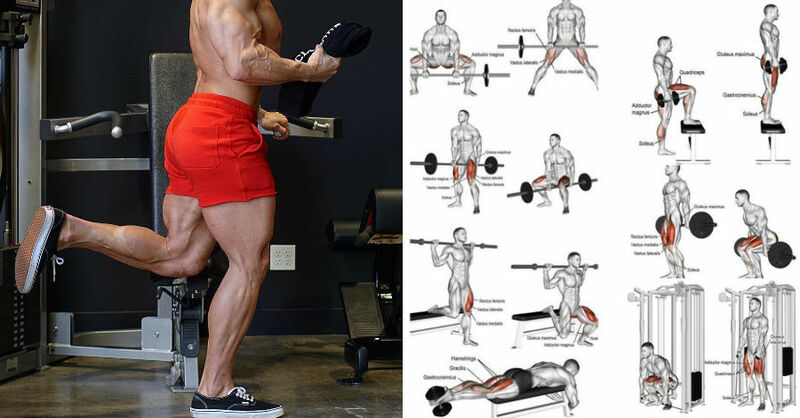 A leg-curl movement, which better emphasises the lower half of the hamstrings above the knee, is also a nice complement to the upper-hams-focused RDL. It’s a pump movement of the first order as well, making it a perfect finisher. Finish off this monster leg workout with 3 sets of hamstring curls, doing a double drop on the last set like you did with the leg press. Warm-up sets are not included; do as many as you need, but never take warm-ups to muscle failure. Choose a weight that allows you to approach muscle failure by the target rep listed. Rest as needed, but try to decrease the amount of rest you need over time. On exercises 5 and 6, do a double drop-set on your final set. That is, once you reach initial muscle failure, quickly reduce the load by about 25 percent and continue the set. Once you reach failure again, do another 25 percent drop and do as many reps as you can. On the first week of this program, do just 2 sets of the first two exercises to control the degree of muscle soreness, and stop all sets of all movements about a rep short of muscle failure. As you progress, adjust the volume and exercise selection as necessary to ensure you remain within your abilities.